Apologies for the less than inventive title there, my brain appears to be on a bit of a go slow today! But I suppose it does the job because today's post is all about some recent beauty faves that I've been loving. 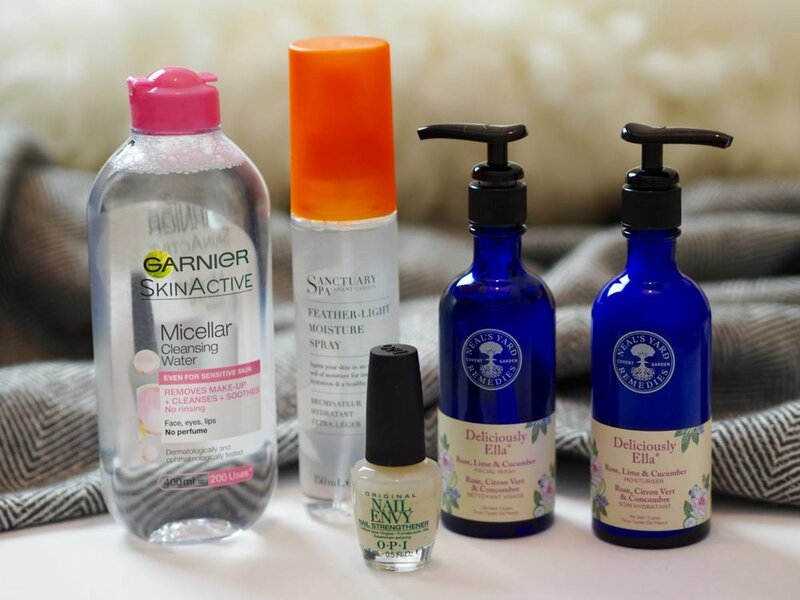 I know that I don't usually share beauty stuff around here, and I am very much an amateur in this arena, but I love reading beauty recommendations from normal people as I find it a bit less intimidating than trawling through some of the big beauty blogs. And I figured that if I enjoy it, maybe some of you guys might like that too, so here we are. I've been using this for a little while now and I credit it with helping to sort my blotchy, blemish prone skin out! I have to admit that until recently I was still using make up wipes to remove my eye make up before cleansing, but I'm now using the micellar water and some cotton pads for that step instead. I find that I don't need to scrub as hard to get my mascara off which I'm sure is loads better for the delicate skin around my eyes. This product has been an absolute saviour for my dry skin now that the colder weather is rolling in. I'm way too lazy to moisturise properly after every shower, but this spray means that I can keep my skin hydrated without spending ages slathering myself in body butters. Plus, it dries super quickly which means that you don't have to wait for ages to get dressed! I was sent these two products from the team at Neal's Yard Remedies and I bloody love 'em! They've teamed up with Deliciously Ella to create some gorgeous rose, lime and cucumber skincare products. The bottles are absolutely beautiful (who doesn't love blue glass!?) and both the facial wash and the moisturiser smell divine - I actually made Sam sniff my face they are that nice! Plus all of the Neal's Yard products are made with only natural ingredients, so there's no nasty stuff in there that will irritate skin. I have terrible nails. I don't bite them but they never grow, and even when they do they're so brittle and weak that they just end up snapping. However in the last couple of weeks my nails have had a bit of a growth spurt and I was desperate to keep them nice and long so I invested in OPI Nail Envy on the recommendation of a couple of friends. It's expensive but so worth it - my nails have never been so strong and I haven't had any snagging or breakages for two weeks now which is a record!